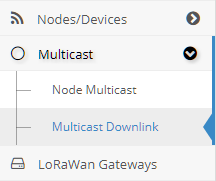 This page represent the portal for sending Downlink to the Multicasts through a defined Gateway. After clicking on Send button the Tx will be immediatly sent reporting a feedback in the table below. This table takes tracks of the previous Downlink Messages. If the message went good the row background color will be white and the Error column will be empty, if not the row will be red and into the Error will be reported the error description. If you want to reproduce a certain combination of input settings just click on one row and ResIOT will automatically fill your input params with the ones of the row. Multicast1 | 1aFe2378 Gateway1 | 8B72BeFFEF10AEB6 12sk 20 multicast1,gateway1 Off 2017-09-07 09:06:04 The payload is not correctly Hex Encoded.